Beginning on September 15, 2010 Great Chicago Italian Recipes.com is pulling out all the stops to bring you the best Italian recipe contest we have yet to offer. This “Mangia Italiano Fall/Winter Contest Italian Recipe ” will focus on your “Main Dish” recipes only. No appetizers, no side dishes and no desserts. Just “Main Dish” recipes will be judged. This contest will feature five top prizes which are listed below. All winners will be notified by email and all winning recipes will be featured on our homepage for one month and listed in our newsletter. 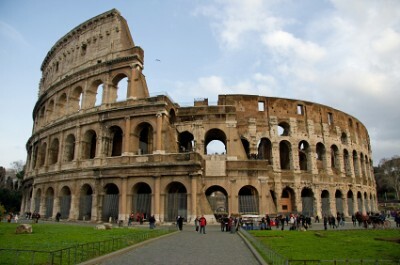 In order to enter just send us your best Italian “Main Dish” recipe with a story. Due to the quality of prizes listed we must insist that each recipe be accompanied with a story to enhance our readers experience. Please read the official rules for details. Also please note that judging will be done by your friends, family and our readers. Only one vote per recipe per IP address will count. More than one vote coming from the same IP address will be deleted. So if everyone in your office votes they may have only one IP address so I encourage votes to be cast from the individuals home computer. Contest ends on March 15, 2011 so this gives everyone plenty of time to prepare your great recipes and cast their vote. The most important thing is that everyone has a great time. Best of Luck! 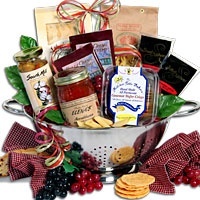 "Italian Gift Basket with Keepsake Colander"
This great grand prize comes with a keepsake colander filled with delicious authentic red sauce, Imported pasta, aged Parmesan crackers, croccantini breadsticks, Italian salad, biscotti and cappuccino for dessert. This is a great prize that can be shared with the whole family. "CucinaPro 150 Imperia Pasta Machine"
This second place prize will keep you busy in the kitchen making fresh pasta everyday. This traditional pasta roller lets you make the freshest pasta you’ve ever tasted right at home. 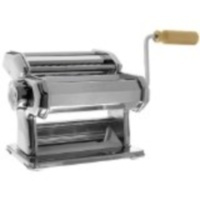 It features a 6 inch wide roller, along with a double cutter for spaghetti and fettuccini. Optional attachments are sold separately. Made in Italy. "Deruta Orvieto 10 inch Pasta Bowl"
Win third prize and you will receive this beautiful Deruta Orvieto 10 inch Pasta Bowl. This bowl was made by hand in Deruta, Italy. The "Galletto Orvieto" pattern originated during the Renaissance in the hill top town of Orvieto, Italy. 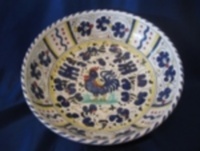 The pattern features a "Galletto" Rooster that symbolizes, blessing , prosperity and good wishes. 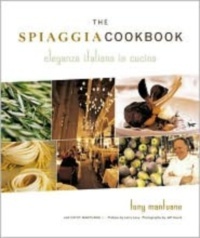 "The Spiaggia Cookbook : Eleganza Italiana In Cucina"
This forth place prize is a great cookbook written by Tony Mantuano, Chef/Owner of Spiaggia’s and Café Spiaggia here in Chicago. Spiaggia is Chicago’s only four star Italian restaurant. Chef Mantuano, along with his wife Cathy, present a beautiful tribute to their restaurant’s Tuscan cuisine. 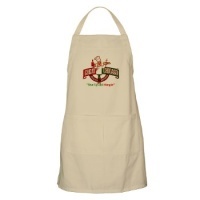 "Great Chicago Italian Recipes Cooking Apron"
Fifth prize will take home our very own "Great Chicago Italian Recipes Cooking Apron". This apron is a must for any home chef. Just slip it on and your ready to cook some of our favorite recipes. Click here to find out how to increase your chances of winning. Click here to to ENTER HERE. Please Note: This "Mangia Italiano Fall/Winter Recipe Contest" is open only to legal U.S. and Canadian residents 18 years of age or older. Entrants may submit one original recipe per day for the duration of the contest. (See Official Rules) The PRIZES awarded for the best Italian “Main Dish” recipe will be 1st Place - “Italian Gift Basket with Keepsake Colander“, 2nd Place a “CucinaPro 150 Imperia Pasta Machine“, 3rd Place a “Deruta Orvieto 10 inch Pasta Bowl”, 4th Place a “The Spiaggia Cookbook : Eleganzia Italiana In Cucina“ cookbook and 5th Place is a “Great Chicago Italian Recipes Cooking Apron“. The contest is open from midnight (12:00 am) on September 15, 2010 to just before midnight (11:59 pm) on March 15, 2011 . Once your recipe is submitted it will be open for visitor voting and commenting. The submissions with the most activity will be declared the winner. The Winner will be notified by email so be sure to leave a good email address where you can be reached. Important: When you send your recipe, story and/or photos you are granting great-chicago-Italian-recipes.com the right to use and/or publish your story, recipe and photo on websites and/or in book or e-book format.